Adaora Allure is an African American author currently based in Shanghai, China. Her affinity for reading and language ensured that she caught the literary bug early. She wrote her first short story at age 8. After receiving an advanced degree in English Literature, she began blogging and content writing for several content forerunners such as Associated Content and Textbroker. Her first full-length novel "Confessions of a Walk Away Wife" is reflective of the lives of many millennial women. Confessions of a Walk Away Wife chronicles Allure's personal changes and self reflection that eventually enable her to claw her way out of the pit of despair and start creating the life she would want to live without fear of failure. Despite her hardships, her compassion still shines through and, as I was reading this moving memoir, I found myself alternatively holding my breath and cheering Allure on as she took the necessary steps to reclaim her time and herself. Pitched toward millennials, Adaora Allure's guide to life is a moving piece that offers a meaningful message for any generation. 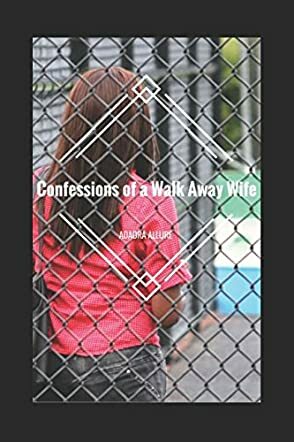 Confessions of a Walk Away Wife by Adaora Allure is the story of a woman who struggled to live for herself after always living for other people. Allure was in a marriage with a husband that made life difficult, all the while being in love with her soul mate, who was someone else. She constantly tried to please everyone around her. She finally realized that the only person she needed to make happy was herself. This is her story about her journey to happiness. Allure has a very poetic style of writing. There is no doubt about what and who she loves in Confessions of a Walk Away Wife. There is also no doubt about who and what angers her. I thought her story was interesting and very relatable. I identified with her being an outsider and never fitting in anywhere. Having a different taste in music other than your friends always makes one an outsider. I admired her for having the strength to leave her husband. Getting a divorce is never easy. There is always that feeling of failure. Allure was able to conquer that feeling and not let it ruin her life. I was glad for her that she finally found her happiness. It was obvious from the very beginning that was where her heart belonged. Overall, I thought this was a good book. Allure has clearly written it from her heart. I am pleased that she finally found where she belongs and I wish her a lifetime of happiness. Confessions of a Walk Away Wife by Adaora Allure is a memoir written by Adaora in the first person. The memoir follows a sequential narrative of events in Adaora’s life for the most part. As we begin the book, we learn about Adaora’s early years and her years of struggle with acceptance of her own looks and appearance, being judged for being black, the challenges with bullying, her experiences with people she knew who lived off and died on the streets, and with drug abuse, violence, and crime. Alongside of this, Adaora also speaks about her college life, education, life on campus, love, and relationships, including her long-term relationship and marriage to Sean. This is a story of her life from the beginning to the present day. I really liked reading Confessions of a Walk Away Wife by Adaora Allure. I expected an average memoir, but the frankness of writing with a no-holds-barred style makes this a compelling read. I liked seeing how she overcame the barriers of her race, prejudice, and background to forge through and let her authentic self come through. This is a story that many people can relate to, who are for various reasons hiding behind a cloak and are afraid to let themselves be completely free and let their true selves come out. This is also a lesson in overcoming any relationship of abuse or neglect of any kind. The formatting of the book could have been more organized, but still the language and style of the writing are powerful enough to make this a worthwhile read! The roller coaster marriage of Adaora and her husband, Sean, is described in profound ways; sometimes, it is heartwarming and other times heartbreaking. The difficulties in forming love-filled, respectful long-term relationships are revealed in the book, Confessions of a Walk Away Wife: One Millennial’s Guide to Divorce and Living the Life You Were Meant to Live, written by Adaora Allure. Adaora discloses her agonizing struggles in school as an overweight, often bullied, young black woman. She is a bright student and achieves much during her high school and college years; and, she discovers her talent for writing. She is successful in her career, and she loves to party. Her relationships with her parents and family members, and with several boyfriends, are very important to her. The deaths of her father and a close friend affect her greatly. Her marriage to Sean is fraught with problems, including post-traumatic stress disorder, anxiety and too much alcohol use by both of them. She did everything she could to make it work. In this memoir, the author blends a number of writing styles. She includes factual storytelling; introspective, reflective treatises – not unlike journal writing; pleas to family and friends; alternating vignettes from the past and present; the list goes on. This unique approach is refreshing and keeps the reader engaged throughout the book. Author Adaora Allure has written an unforgettable work in Confessions of a Walk Away Wife: One Millennial’s Guide to Divorce and Living the Life You Were Meant to Live. There is a rich complexity to her journey of pain and healing captured within this memoir.